Finally, An Inexpensive Full-Featured Quality 3D printer! The Duo accommodates more industries than it’s competition. It contains more features, it’s easier to operate, and it is more future proof and reliable than any other 3D printer currently available. Everything comes down to personalization, flexibility, and adaptation for effective 3D printing. Unleash your potential with the Duo! Go from a 3D digital model to a printed, tangible object with only a few clicks! The versatile 32-bit web and touch screen interfaces of the Duo empowers new users to create and satisfies the needs of advanced users. We’ll never stock a Duo until it passes a strict quality standard checklist. You’ll receive your Duo’s first print with delivery. An Independant Dual Extrusion system increases your 3D printing capabilities! Greatly decrease print and design time by simultaneously printing a model and its mirrored counterpart. Move from jobbing to in-house light batch production with the capability of printing duplicate parts and components. Remove the previous limitations of 3D printing and complete complex prints with challenging shapes, geometries and properties. Create your prints using 2 different colors, 2 different materials, or 2 similar materials. The Duo is not application-specific. 3D printing applications that traditionally would require the use of another printer, can be easily by the Duo in default or with a simple 1 minute swap of the tool head. The Duo directly supports the widest range of filaments – as long as it melts under 500°C and comes in the most common diameter (1.75mm) – you can print it on the Duo! The modularity of the Duo enables it to grow as 3D printing technology advances. You can easily modify your machine to fit your specific needs. Toolheads and components for more applications are in the pipeline, effectively making the Duo a futureproof 3D printer! 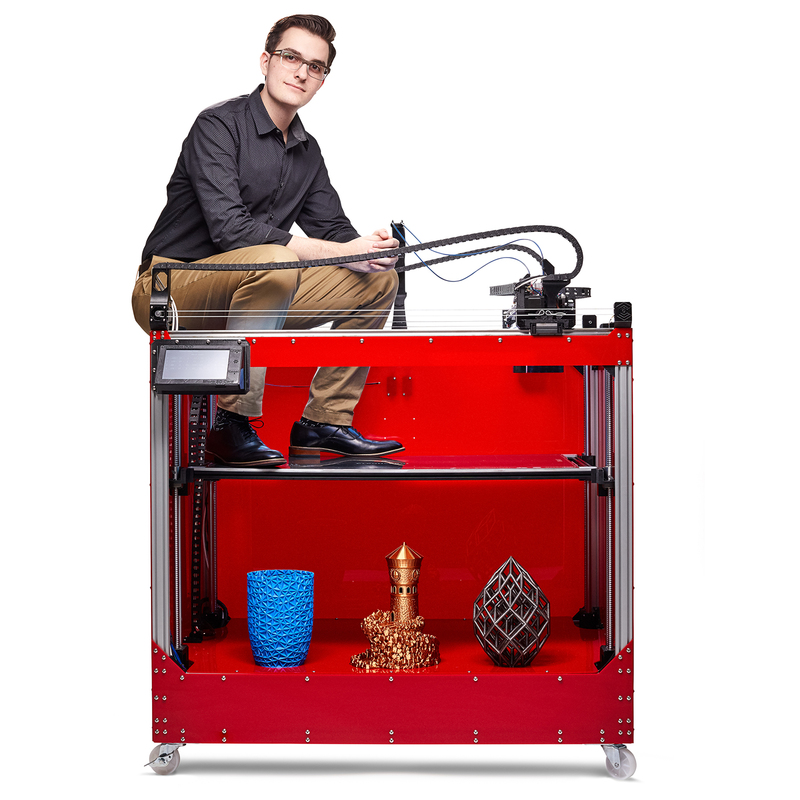 The Duo challenges the price point’s definition of a large-format 3D printer by featuring a build volume greater than 10.5ft³! (910mm x 460mm x 675mm or 910mm x 500mm x 675mm if using one head). With support for layer resolutions as fine as 30 micron and movement resolutions with precision of 256x micro-stepping (16x greater than most printers), the Duo is one of the most precise FFF 3D printers available. At Creative 3D Technologies, we’ve worked to ensure that the Duo is only crafted with high-quality components, so that our clients can receive an optimal printing experience. Duet3D Electronics – A 32-bit controller provides a built-in responsive web and touch screen interface. Geckotek Build Plates – Removable and flexible plates that can adhere and release almost any 3D printing material with ease. Bondtech Dual Drive Extruders – Provide precise, reliable, and consistent filament extrusion. Genuine E3D Hotends – High quality hotends provide reliable and consistent filament extrusion and temperature stability. Genuine Hiwin Linear Guide Rails – Provide the best linear movement possible, smooth and friction free! Ball Screws – Provide smooth, accurate, and backlash-free Z-axis movements. Dyse Design Run-Out Detection – Provides instant detection if you’ve ran out of filament. In addition, it cleans the filament. It’s simple; you don’t need extravagance to drive efficiency. To prove this point, displayed above is our 180lb CEO seated at one of the Duo’s weakest points. We spend on performance, quality, and strength to help make the Duo the most powerful and cost-effective 3D printer currently available. Despite its large footprint, the Duo still fits through a U.S. standard-sized residential door. With built-in casters, it’s easy to move at a moment’s notice. Park your primitive practices! Damaging chisels or hammers are not needed with the Duo! 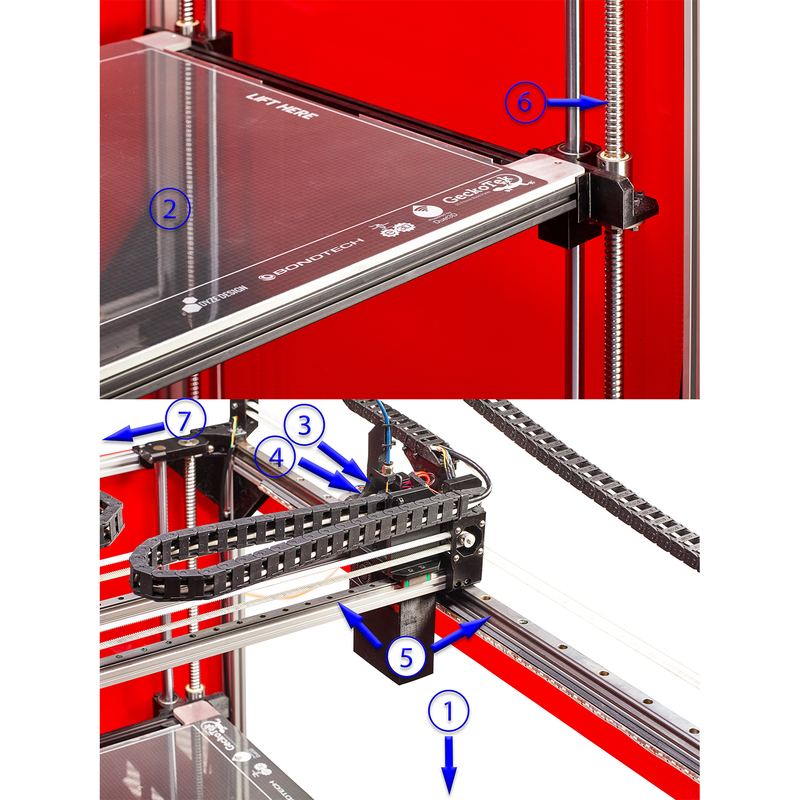 Your prints easily separate from the print bed with Duo’s removable and flexible build plate system. The Duo offers a maximum reliable print speed of 175mm/s. When combined with the Independent Dual Extrusion System, you’ll save countless hours on all of your 3D work; ultimately reducing downtime dramatically and driving workplace productivity. Power Loss Detection – Allows users to resume a print after a loss of power. Stall Detection – Recovers prints in the event of a skipped step. Trinamic Stepper Drivers – High power, quiet motor movements. Autonomous Bed Leveling – Printer adjusts the 4 Z motors individually to eliminate bed tilt. Differential IR Probe – Precise Z probing with repeatability of .01mm. Status-Indicating LEDs – Provides aesthetic and informs user of print-status. Drag Chains (all axis) – Keeps wires in order and prevents melted or twisted cables. Capricorn Bowden Tubing – Highest quality of PTFE tubing provides a smooth, low friction filament path. Wifi / Ethernet Connectivity – Connect from any computer device to control the Duo. lower High Quality Timing Belts from Gates – Durable, resistant timing belts. Misumi Aluminum Extrusions – Makes for a strong frame & easy modification. Keenovo Heaters – High power heaters provide faster heat up times, and accurate temps. Filament Purge Buckets – Keep your prints ooze-free by purging filament into the buckets. Genuine Mean Well Power Supplies – High quality & reliable. High-Torque Stepper Motors – Powerful for effective movements. Mobility – Locking casters and bottom grips to allow for easier movement of the printer. Full Enclosure w/ Particle Filtration (optional) – Enables use of more filaments by trapping in heat and filters printer emissions. Filament Dry Box (optional) – Keeps your filament dry and moving smoothly. Camera Add-on (optional) – See an image of your print’s progress through the web interface.